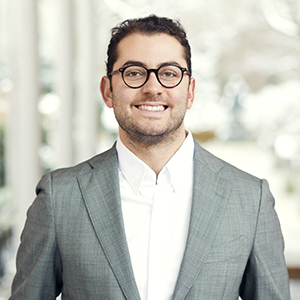 Thomas Bekhazi brings a passion for extraordinary service and an international worldview to every real estate engagement. Born in Florida, he spent much of his life in Paris where he attended business school and obtained a master’s degree. He then went on to study and work in São Paulo. Thanks to his hotelier father, Thomas has traveled extensively and stayed in many of the world's greatest hotels — an experience which is at the origin of his early grasp for real estate valuation as well as for understanding the added value impeccable service brings. "I truly believe that by traveling around the world, I have gained the ability to perceive people's needs, regardless of background," he explains. "Throughout my professional life, I've learned that identifying people’s needs and striving to the best of my ability to help them achieve their objectives is the real key to success." A calming and reassuring force, Thomas understands the power of listening, and he knows that an informed client is a successful client. He goes to great lengths to share his substantial market knowledge to ensure that his clients are sufficiently knowledgeable to make the best value-to-money decision possible in relation to their financial situation and personal objectives. Thomas resides in Williamsburg and is fluent in English, French and Portuguese. In his free time, he can be found playing cards with friends and listening to live music in Brooklyn. He also loves sailing, traveling and cooking for loved ones. "Before I moved to NYC, people told me finding a home would be long and difficult. Then I met Thomas. Within a week, I'd signed the lease to my first home on the East Coast. Two years later, I was ready to become a home owner. Again, I turned to Thomas. In under three months, I had the keys to what is my current dream home. Thomas has my highest recommendation for anyone looking to rent or buy a home in New York City." "Thomas’ work is of the highest quality. Not only did he find me my dream home within a week of me deciding to look, he then guided me through each step of the process, masterfully securing a fantastic deal and always keeping me informed and feeling like we had the upper hand. I would highly recommend him to anyone." ""I met Thomas when I was looking for an apartment in Brooklyn. His assistance was extensive, constant, and valuable. Thomas helped me during the entire purchasing process, and made me feel that I was in good hands. He also proved to be professional accommodating, flexible, and very patient - he was always very responsive to my "thousands" of emails and requests. In conclusion, I would highly recommend Thomas as a broker, and definitely ask him to assist me in the future." "I met Thomas when I was looking to rent an apartment in Bushwick. I stopped by his office in Williamsburg and Thomas directly proved professional and flexible to work with all around. He was attentive to my needs and requirements and couldn't have been more efficient; indeed, I wanted to rent the first apartment we visited. On top of that Thomas really made sure the entire process was as easy and painless as possible. In a nutshell, working with Thomas was easy and efficient." "My experience working with Thomas was effortless and nothing short of excellent. Opening a new business and finding the perfect location can be stressful and tedious. Having someone on your side who is a consummate professional and walks you through the entire process is a tremendous help and weight off your shoulders. Thomas found us several properties based on our criteria, did a great job negotiating on our behalf for the location we ended up choosing. He would absolutely be the first person I reach out to for all of my real estate needs. Highly recommend!" "Our office has worked with Thomas, and have found him to be a responsible and diligent broker in the handling of his clients. His go getter attitude stands him apart from other brokers who merely wait for listings and clients."